Once again, the Right to Know mob is at again with the fear mongering. 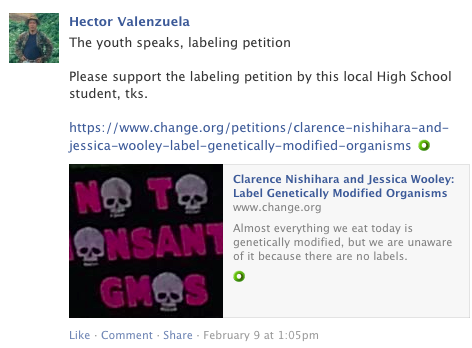 Now they have gotten their kids to be the puppets of these parents with this petition to label GMOs. Hector Valenzuela is also joining in on this skull and crossbones campaign. Just read on at some of the comments people left on the petition also. Our young people know what is right, that we have the right to know what is in our food! We have worked for years to convince our youth to eath ‘healthy’ foods – and now that they are finally listening – the message we are sending them by not labeling GMO is a negative one. How can we teach our children to read labels, and know what’s in their food, avoid junk food etc.. and then turn around and tell them they don’t have the right to KNOW what is in their food? My kids tell me that it makes no sense, and I agree! We have a right to know ALL ingredients in our food. If it is unique and different enough to be PATENTED, then it is not a typical normal food. Remember, the biotech industry keeps telling us that GMO’s are the ‘same’ as regular food – while in the same breath they tell us they are different, unique and patented (and they defend those patents by vigorously suing farmers) – So which is it? Either they are not different and normal, or they are unique and different, and PATENTED. The industry cannot have it both ways – and we deserve the RIGHT TO KNOW all of the ingredients, ALL of the ingredients in our food. Especially the patented ones. We have the right to know what is in our food. Please label our food. There are a growing number of consumers who are concerned about GMOs and have consciously boycotted products that are not labeled NON GMO or Organic. This puts every company who use crops that are Genetically Modified at risk of market failure. Everyone is paying the price for a few. Consumers look for product information on the label to make educated choices, especially when choosing food. Consumers who have food allergies rely heavily on proper labeling and AVOID products that are not clearly labeled. Gluten Free labeling is a recent example of a labeling law that doesn’t go far enough to help consumers, as it only refers to gluten found in wheat, and does not take into consideration gluten from barley, rye, or oats. While users appreciate the label, they often find themselves at risk because the product does in fact contain gluten. Clear laws that include EVERY form of GM/GE products should be properly labeled on ALL food, even that which is consumed by animals. why do i need to bill to obtain information and/or knowledge? do we live in nazi germany, or mccarthy era USA? The YOUTH are smart enough to realize their future! 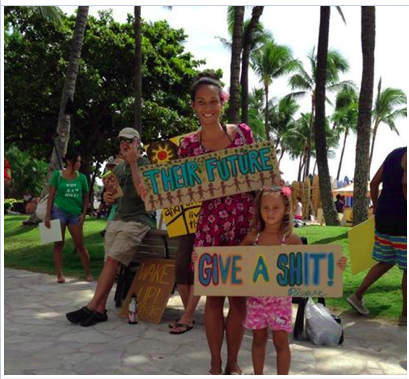 Our keiki are being used as test subjects w/o their (and our) consent. We all have a right to decide what we will eat, and whose products we will buy. We also have the right to VOTE, and I, for one, will exercise that right to elect officials who listen to their constituents, not mega-corporations. I like that the youth of tomorrow are getting informed and taking charge of their health and the environment they will live with and for future generations. GOOD LUCK and may GOD Bless ! 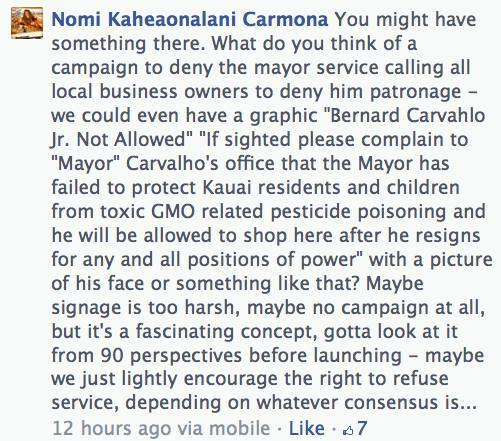 Note that Larry Schneider also made this same comment too about GE food, with Gary Hooser’s endorsement also. They openly admit to scaring people! What’s the biggest joke is that they claim that they want the right to know and that a label from the government is going suddenly make them trust it again. 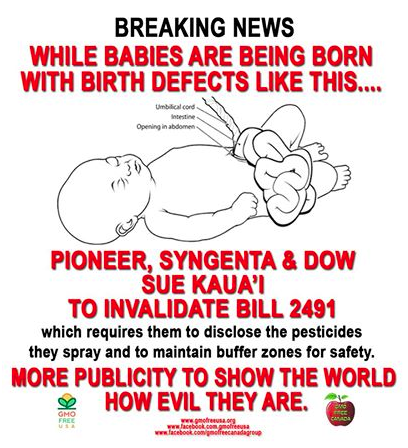 They never trusted the state or Governor Abercrombie’s efforts to work with the seed companies with the right to know issue, so they went ahead and passed their own faulty laws. Is a label on GE foods really going to suddenly make these right to knowers trusting of government again? Yeah right. It isn’t going to fix anyone. 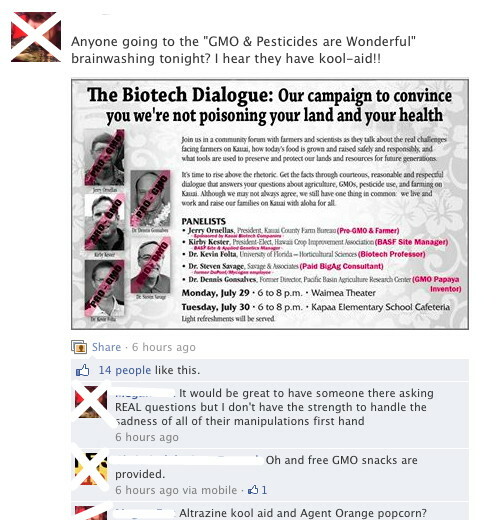 They should ask their own industry to label food as GMO Free since they trust organic so much more than anyone else. This entry was posted in Uncategorized and tagged Gary Hooser, GMO Free Kauai, Hawaii SEED, Hector Valenzuela, Jessica Wooley, Right to know on February 14, 2014 by hawaiifarmersdaughter. Inciting the Mob: Let the Fear Mongers Unite! Bring on the FEAR MONGERING once again! The seed companies have filed a lawsuit against the county which comes as no surprise. The health studies and environmental studies found nothing to support their claims so time to spread more and more fear. Just to start off the day, GMO Free USA posts this meme of a baby with a condition called gastroschisis. It is nice and scary and attempts to make the uneducated social media follower think that the seed companies have something to do with this. Of course, few of the A’oles would ever know what the condition is but will automatically correlate biotech with this birth defect. However, a skeptical reader will attempt to look further than just a picture for their information and find that there is no known causes of this defect . It is a very rare condition but the meme implies that this is a very common occurrence which the data does not support. Another scary picture posted of Facebook recently was this condition called polydactly by a well known A’ole radio personality. She purports to link this to working on the seed farms. Well, when you look up this condition more, you find that it is genetic and has no link to GMOs. People have been experiencing this condition long before biotech was even heard of! Remember that just because your read or saw it on your friend’s Facebook page, it doesn’t make their claims completely true. The goal of the A’oles is to create fear and doubt to win the masses to created mob rule. Mob rule based in fear and misinformation has worked well because of politicians afraid of losing their seats in this year’s election! 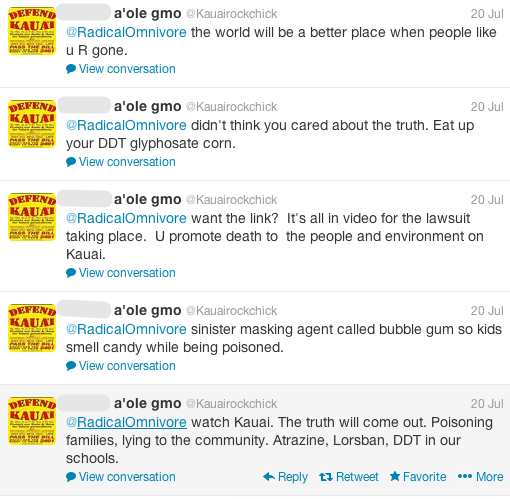 This entry was posted in Intelligence Quotient, Research 101 and tagged anti-GMO, Gary Hooser, GMO Free Kauai, GMO Free USA, Kauai, Ohana O Kauai on January 12, 2014 by hawaiifarmersdaughter. 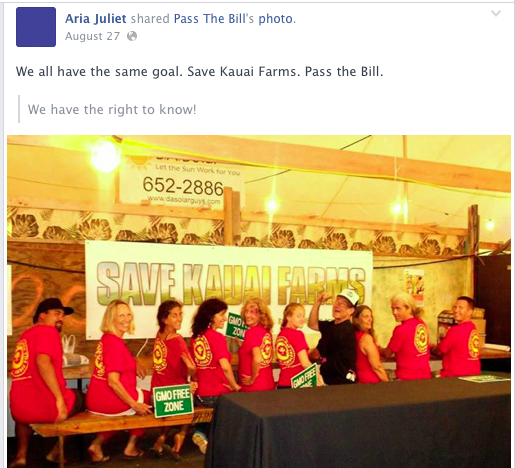 On a freshly posted blog by Civil Beat about the lawsuit filed by the seed companies on Kauai, there is proof that there was no science involved in the whole issue to begin with clearly stated by this activist. 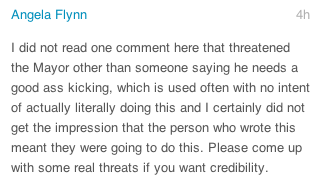 It’s clear here that the whole issue was based in fear and hearsay. No evidence presented would ever change these folks’ minds at all. It really didn’t matter if any attempts were made by the companies to be good neighbors because nothing would ever be good enough except being completely out. Let’s see what holds up in the court where evidence is key and hearsay is not. 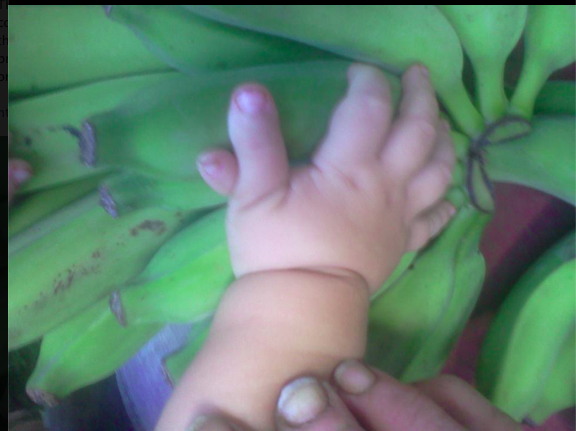 This entry was posted in Intelligence Quotient and tagged biotechnology, Gary Hooser, GMO Free, GMO Free Kauai, Kauai County Hawaii, Tim Bynum on January 11, 2014 by hawaiifarmersdaughter. If you can’t find it, here it is. 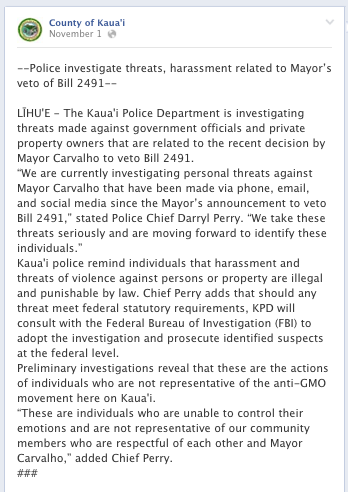 This entry was posted in No Aloha Commentary and tagged Angela Flynn, Death threat, Facebook, GMO Free, GMO FREE Hawaii, GMO Free Kauai, Natural News, Organizations, Recreation on November 23, 2013 by hawaiifarmersdaughter. 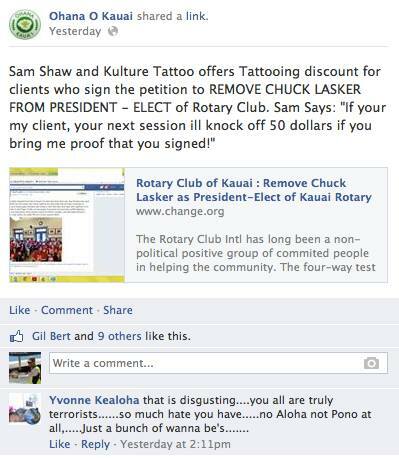 She apparently thinks that there is no aloha when people speak up against these activists, and that anyone who does is a troublemaker. Of course, they only want their voices heard and not anyone else’s. 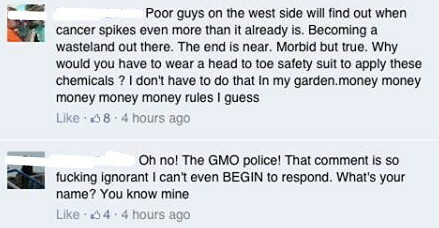 Then she goes on to say that threats made against the Mayor were made by my little corn friend, Frank n Foode…(seriously?). I can’t quite figure out why I would need to threaten the Mayor but she has something in her mind that there is a reason for it. They still can’t figure out that they themselves are looking bad because of the nature of their commentaries. Last but not least, Helen has to throw in an insult. No surprise at all for that is the Kauai A’ole way. As much as these folks love to talk about them being pono and having lots of aloha, it is clear that they have no clue about it already. Same goes for their leader, Gary Hooser and his antics. Monkey see, monkey do. This entry was posted in No Aloha Commentary, No Aloha to Farmers and tagged Activism, agro-terrorism, anti-GMO, Babes Against Biotech, Bill 2491, biotechnology, Brenda Ford, Critical thinking, Facebook, Gary Hooser, Genetically modified organism, GMO Free Kauai, Hawaii SEED, Kauai, Vandana Shiva on November 13, 2013 by hawaiifarmersdaughter. 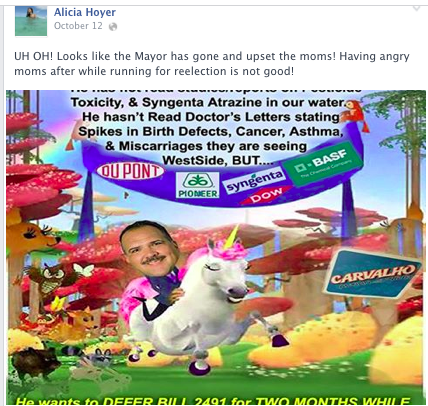 Funny how the news stories explicitly stated that the threats to the mayor were not representative of the anti-GMO movement. 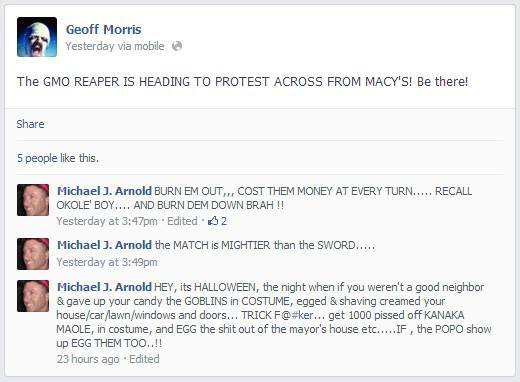 Then another supporter said that they are 0.01% of the activists and that there is no engaging with these folks. Really Aria Juliet? 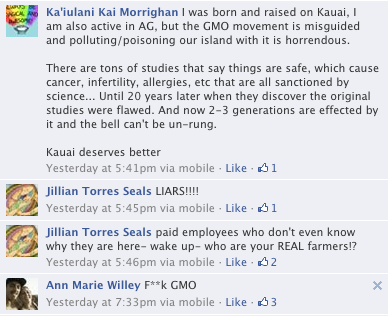 Interesting because you’ll find all of these people in the GMO Free Kauai group. 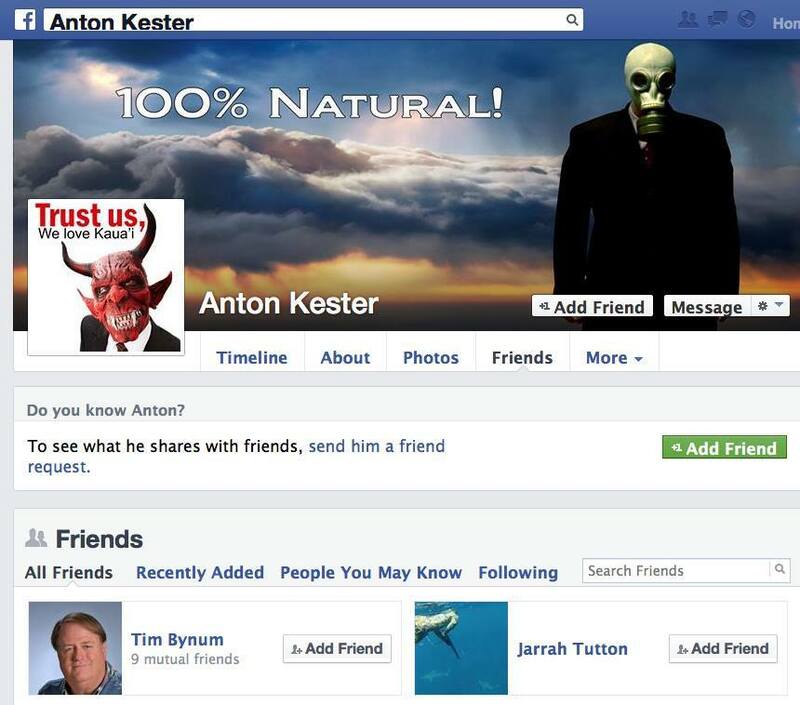 These misguided people seem the be the very ones that Hooser and Bynum are associating with. The writing is on the wall. Do you actually think that the public is oblivious to this? 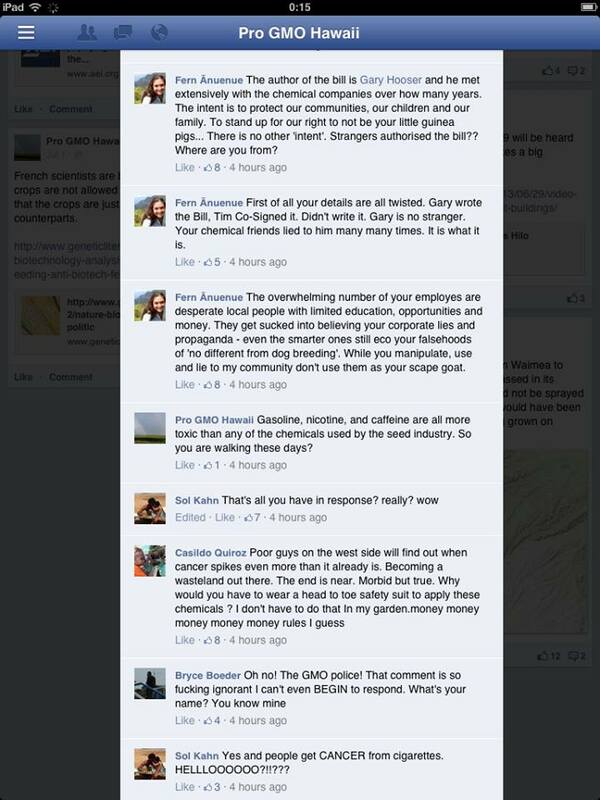 From the Pro GMO page also with Fern Anuenue. 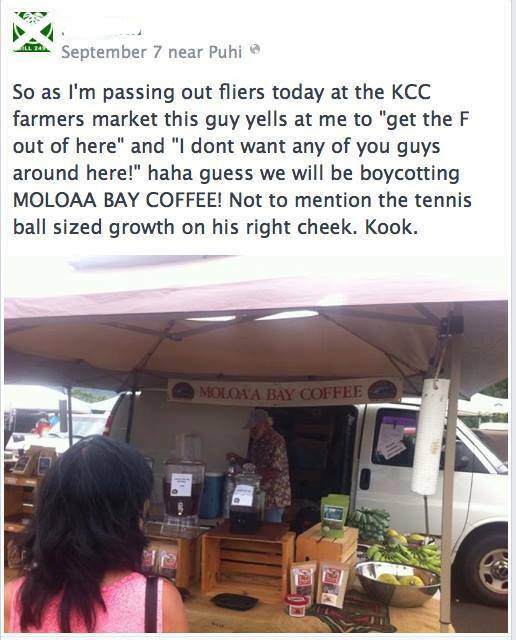 And the anti-aloha just goes on and on. This entry was posted in No Aloha Commentary, The No Aloha Club and tagged Christi Demuth, Gary Hooser, Genetically modified organism, GMO, GMO Free Kauai, Hawaii, Hawaii SEED, Hooser, Kauai, Megan Fox, Tim Bynum, United States on November 11, 2013 by hawaiifarmersdaughter.